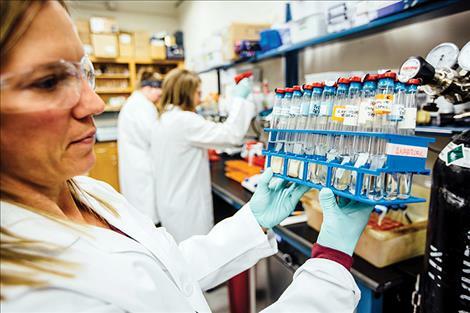 Dana Skorupa, assistant research professor in MSU's Center for Biofilm Engineering, holds a collection of microbes sampled from Yellowstone National Park thermal features. BOZEMAN — As tourists gathered on a cool June morning to view some of Yellowstone National Park’s most iconic geysers, Montana State University researchers took to the boardwalks for another purpose: to collect trash that could lead to new ways of recycling plastic. Steam from nearby Old Faithful billowed in the breeze as the researchers shuffled past geyser-gazers, fixing their attention instead on the shallow, orange-tinted waters surrounding the thermal features. “There’s a bottled water lid!” exclaimed Megan Udeck, a junior from Missoula who is majoring in biotechnology at MSU. That cued Russell Bair, one of two park rangers accompanying the crew, to extend his trash-picker and pluck the small cap from the mineral-encrusted rivulet. Udeck and two other students waited with rubber-gloved hands to receive the quarry. “The trash in these springs could be a natural medium for microbes that could break down plastics,” explained trip leader Dana Skorupa, an assistant research professor in MSU’s Department of Chemical and Biological Engineering. Moreover, she said, because the organisms live in near-boiling water, it means they likely can withstand the heat that helps plastics soften and become easier to break down. Recently, when Skorupa and other researchers in MSU’s Thermal Biology Institute and Center for Biofilm Engineering collected water samples from Yellowstone hot springs and inserted small pieces of certain plastics back in the lab, they observed microbes colonizing the material. The team’s Yellowstone foray in June marked their first attempt to collect additional microbes that may already be thriving on various plastics, and then further cultivate them in the lab, Skorupa said. 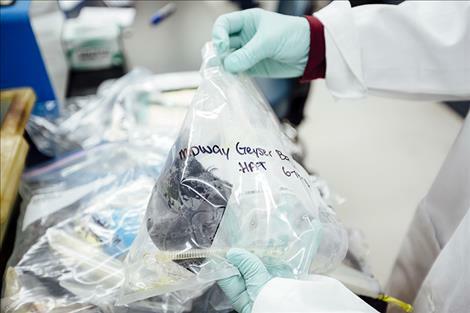 The project’s principal investigator and director of MSU’s Thermal Biology Institute, Brent Peyton, is optimistic that they might find microbes that could naturally break down plastics into their raw ingredients, which could then be used to make other plastic products. “There’s a huge diversity of organisms in the hot springs, much higher than we originally thought,” Peyton said. While hot springs may often appear to be devoid of life, a sugar cube-sized portion of water from some Yellowstone thermal features can contain as many as a million cells of bacteria and archaea, he said. For the rangers, the June outing was a normal morning. Each day they walk the boardwalks throughout Yellowstone, collecting a variety of trash — windblown wrappers, dropped cups, even coins and other objects ceremonially tossed into hot pools. “We get some interesting stuff,” Bair said, adding that he was glad that the plastic from the day’s cleaning would go to beneficial use. Around the time Old Faithful spurted skyward, the four scientists spotted a camouflage ball cap in a trickle of geyser runoff. Skorupa used a sterilized pair of heavy scissors to cut two small sections from the plastic in the hat’s bill. Ashlyn Hemmah, a sophomore, helped prepare the samples for the trip back to the lab: one into a cooler of dry ice to be frozen for DNA analysis, the other packaged with hand-warmers to keep warm for cultivation. “There’s a spoon out there!” said Noelani Boise, a senior double-majoring in environmental biology and German. Having grown up in Montana’s Paradise Valley, she was inspired from a young age to become a scientist in Yellowstone. “I’m excited to be doing this,” she said. All three of the students were selected to work in Peyton and Skorupa’s lab after taking a course in MSU’s Honors College called Extreme Microbiology of Yellowstone. The class, taught by Skorupa, gives students hands-on field and laboratory experience with the microbes from Yellowstone’s unique geothermal hot springs. As the researchers completed their half-mile boardwalk loop, Skorupa said she was pleased with the samples taken, which included various wrappers and other bits of plastic. The rangers carried a bucket full of non-plastic litter.